How do civil society organizations campaign in Europe, how can it be compared to campaigning in China’s restricted media landscape? What are the hot topics of NGOs in Europe and in China? 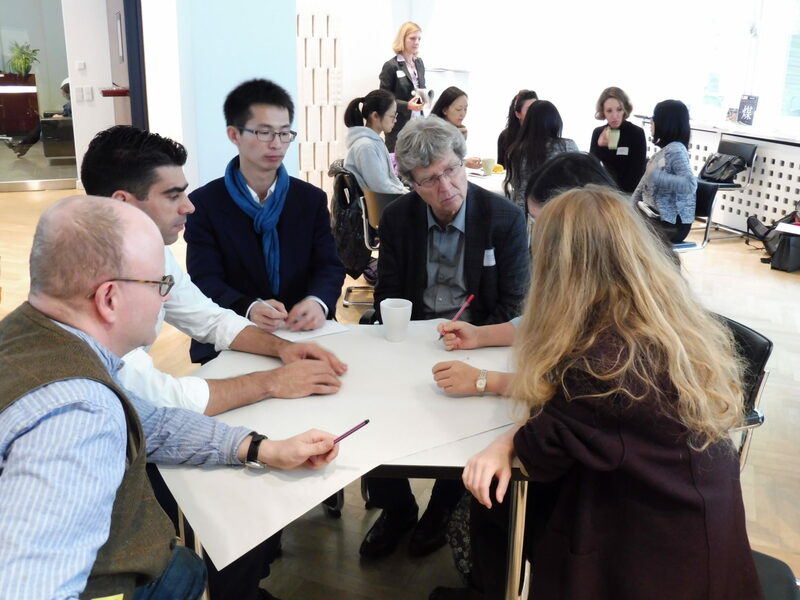 What can Chinese and European NGOs learn from each other? A week of field trips, political discussions and information exchanges about various NGO experiences in Europe and China awaited participants on a visit to Berlin from October 31 to November 4, with expert input that covered topics like civil society involvement in urbanization processes, trade agreements, environmental litigation and sustainable living. 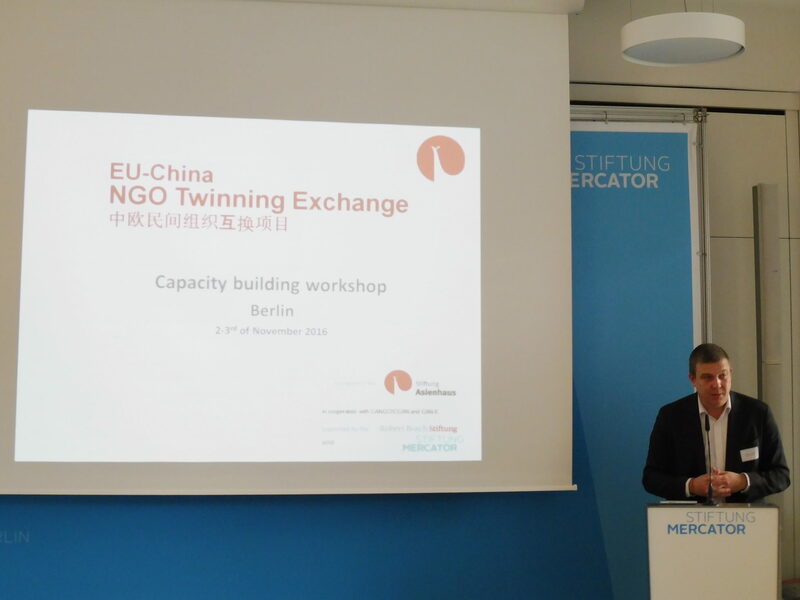 The event was jointly organized by Stiftung Asienhaus, China Association for NGO Co-operation (CANGO), and the Climate Action Network Europe (CAN Europe) in order to enable the twinners to exchange ideas and share their twinning experiences with others. 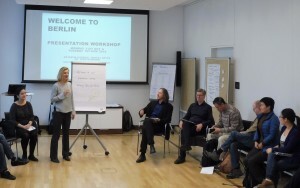 Stiftung Asienhaus, CANGO and CAN Europe were kindly supported by Robert Bosch Stiftung as well as Stiftung Mercator. The participants of this year’s program came from China, Germany, Belgium, Spain, Latvia, Portugal, Bulgaria, France, and England. During the first two days the participants had the opportunity to work on their presentation skills when facing an international audience. This intercultural presentation workshop was held by Antariya Kaeding, Moritz Meyer and Dr. Jens Rogmann of the University of Hamburg. During the course of the Workshop Week this training culminated in creative and expert outputs from all 12 twinning pairs. The following two days, around 50 international guests listened to NGO expert talks from both regions, Europe and China. 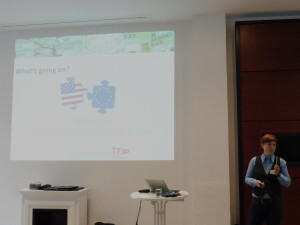 Nelly Grotefendt (Forum Umwelt und Entwicklung) introduced the various experiences and the history of TTIP-campaigning on the global level. She gave an overview on the main reasons for resistance to TTIP along with the different plattforms and initiatives against it. She also described the very successful instrument of the “European Citizens Initiative” (ECI) which was used to hand in legistlative proposals to the EU council. The European Anti-Coal campaigning was introduced by Elena Bixel (CAN Europe). For the local level, Denis Petri (Volksentscheid Fahrrad Berlin) introduced the very impressive referendum on Berlin’s biking infrastructure. In the discussion, it became clear that the understanding of the EU and its trade souvereignty over the memberstates was difficult to understand from the Chinese perspective. On the topic of coal, the audience learned, that some European countries are actually “coal free” (stopped the coal-fired turbines that generated electricity, this goes for e.g. Belgium, Scotland and Switzerland) and only 24% of Europe’s electricity mix consists of coal burning, while it is a staggering 70% in China. Then again, China is not that different from other EU countries like Poland where 80% of the electricity stems from coal power plants. Elena Bixel (CAN Europe) and Roland Joebstl (European Environmental Bureau) agreed, that coal and nuclear energy need to be phased out at the same time. 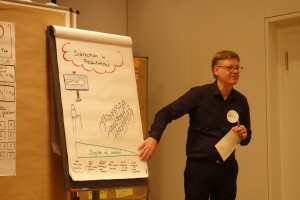 “It’s possible – not only possible, it’s necessary!” Roland Joebstl said. 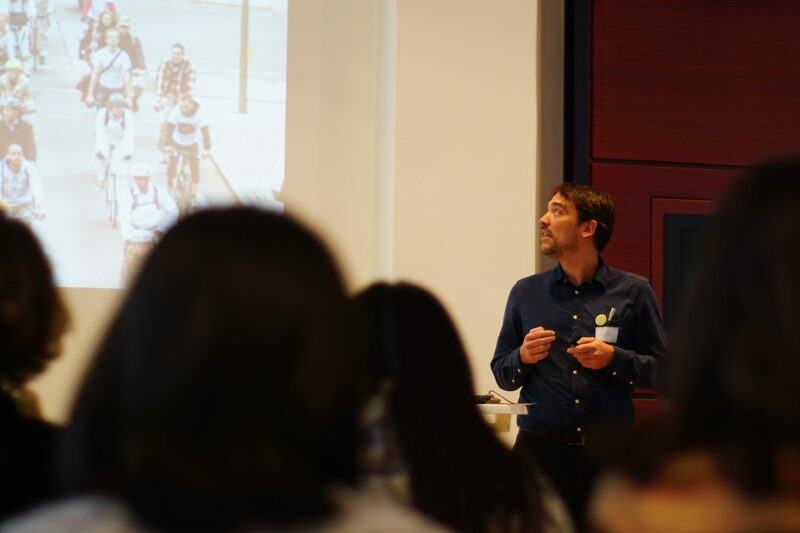 Regarding Denis Petri’s talk, Yu Yin (Stiftung Asienhaus) as well as Deng Yang (CSCP) and Jeanne Cao (Institute for Sustainable Environment and Energy) told the audience about different cycling initiatives in different Chinese citities. The main problem in China seems to be very similar to Europe-the missing infrastructure. Hou Yuanqing (China Green Carbon Foundation, China) was especially impressed by the European passion for bicycles. After visiting Brussels, Cologne and Berlin he stated “In China, during the past ten years the streets have become a kingdom of cars.” Referring to presentation on making Berlin’s biking infrastructure safer, Hou Yuanqing added “I am suggesting to promote this in China where bikes have become unpopular!”. 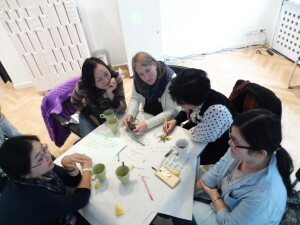 The fourth day, November 3rd focussed on the participants’ work during the exchange program. After short welcome speeches by Clemens Spieß as representative of one of the program funders, the Robert Bosch Foundation, and Dr. Nora Sausmikat from Stiftung Asienhaus, 12 NGO representatives described their Chinese /European twinning in varying formats. 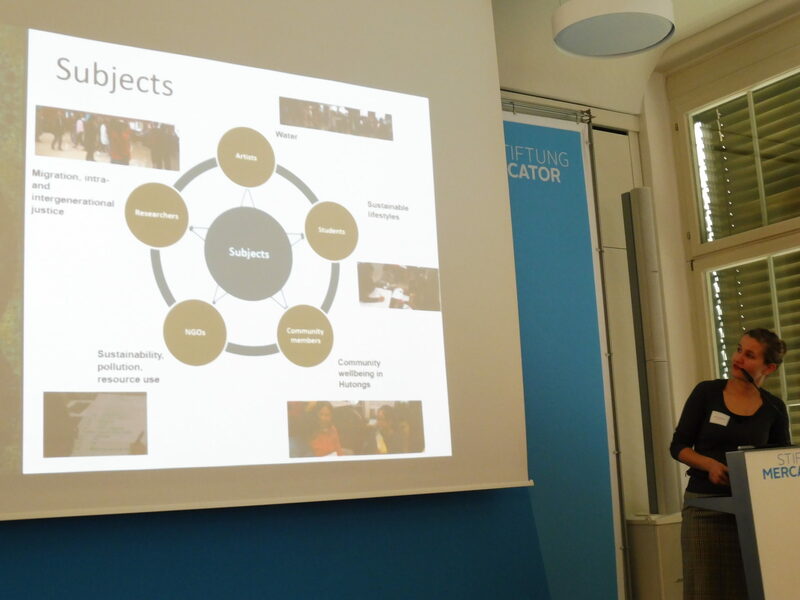 First, Louisa Kistemaker, who is an alumni of last year’s program, informed the audience of a follow-up project, a tool of the Stiftung Asienhaus pillar of the program. The follow-up (all follow-ups are documentated on the project webpage eu-china-twinning.org) consitsted of an environmental education festival in Beijing. 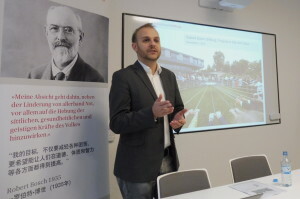 It was jointly organized by her NGO (a tip: tap e.V., Germany), as well as the three Chinese organizations EcoWatch (Kunming) the FCASEC (Beijing) and Evergreen (Beijing). According to Louisa Kistemaker the organizers are already looking forward to “the follow up of the follow up”. There have been too many highlights during the Twinner’s presentations to report on in this summary. 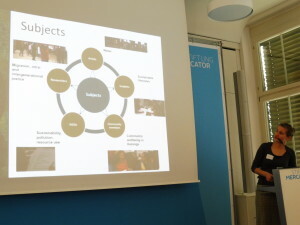 Please click here to find the ppt’s, a photo or even a short video (Yao Zhilu’s and Antoaneta Pophlebarova’s rap on twinning shouldn’t be missed) of the presentations. 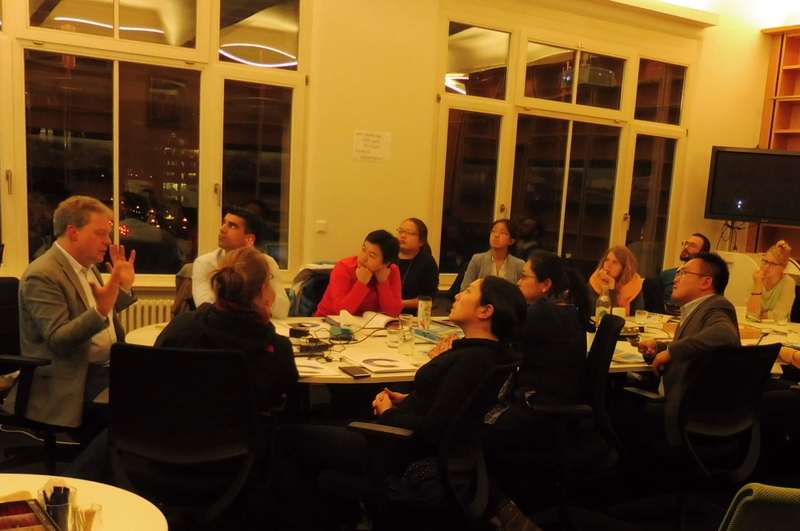 Day 5, November 4th, started with a presentation by Thomas Henneberg of the Robert Bosch Stiftung on their China-Program, a high number of vastly diverse projects were shortly introduced to the interested Chinese/European audience. 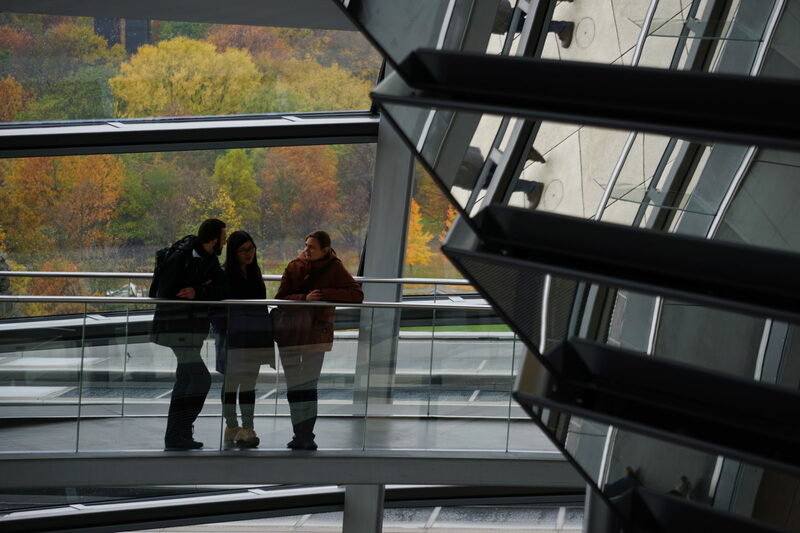 The field trip to the German Parliament following this presentation was definitely one of the highlights of the very last day of the Capacity Building and Reflection Week in Berlin. 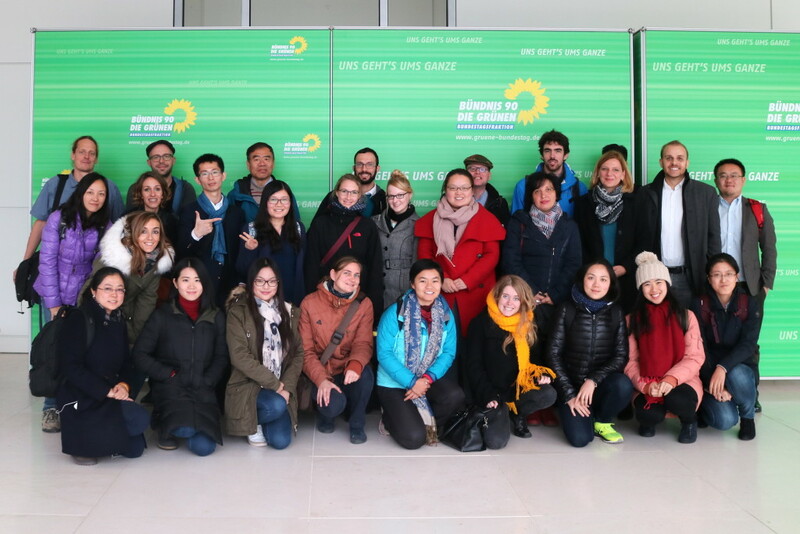 Participants visited the Reichstag building before they had the opportunity to meet two German politicians from the party Alliance 90/The Greens in person: Dr. Michael Weltzin, who is policy advisor for climate issues, and research associate Stephan Bischoff. 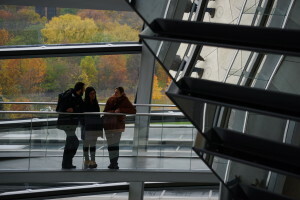 They answered the twinners’ questions about the German Energiewende on behalf of Annalena Baerbock who is a member of the parliament and had arranged this meeting but could unfortunately not take part. 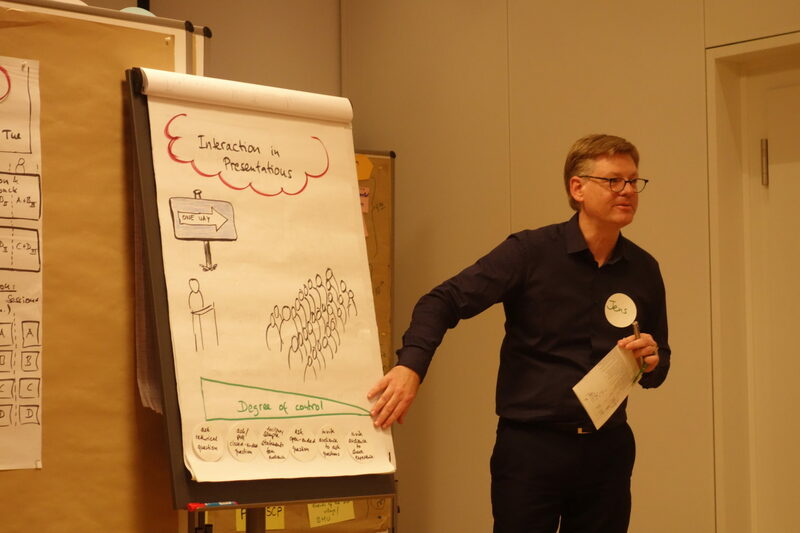 The very last item on the agenda of the Capacity Building and Reflection Week was an invitation to the premises of the European Climate Foundation where Dr. Martin Rocholl, Head of the foundation’s Germany program, discussed environmental issues with the twinners. The input given by Dr. Rocholl on the question “Where are the main strategic challenges for German and European climate policies?” sparked a lively discussion that covered many different topics in the field of social justice as well as climate change and renewable energies. As Dr. Rocholl underlined, the situation of the energy companies RWE and Vattenfall is problematic due to their portfolio mainly consisting of coal and nuclear, both of which are supposed to be phased out. The issue concerns the financial resources of said companies when considering nuclear waste storage. Also, possible solutions for the 15.000 coal workers in Germany which might lose their jobs soon were discussed. Antoher topic was the guaranteed feed-in prices for renewable energy in Germany. He highlighted the fact that Germany is supposed to reach 50% electricity consumption coverage by renewable energy sources within the next ten years. With such positive thoughts the program’s agenda was concluded and participants, who had gained many new impressions and ideas during this week of exchange and reflection, left to various destinations. Posted in: News, Twinning News 2016, Workshops.